How was the ancient Eastern Gate of Jesus' time rediscovered? The Eastern Gate of the Old City of Jerusalem is the only one of its nine gates that is closed. It is called the Eastern Gate because it faces east. It is also known by other names, like the Golden Gate. It was closed in the 1500's when the current walls were rebuilt by Suleiman the Magnificent. The Bible indicates that the gate will remain closed until the Messiah returns (Ps. 24:7-10; Isa. 63:1-6; Ezek. 44:1). Over the years there has been much debate over where the Eastern Gate at the time of Jesus was located along Jerusalem's eastern wall. No excavations could be made because of the Muslim cemetery that is located in front of the gate. But, in 1969, Dr. James Fleming accidentally discovered the location of the First Century gate. On our show Christ in Prophecy, Dr. Fleming shared with us that fascinating story and explain the significance of his discovery. Dr. Fleming has lived and taught in Israel for the past 37 years at Jerusalem University College and at the Hebrew University. His first claim to fame is that he discovered the ancient Eastern Gate buried beneath the current one. 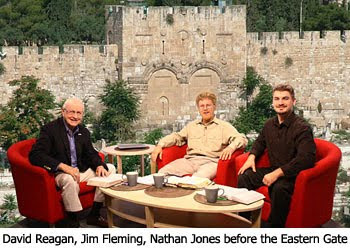 Dr. Fleming has walked or motorcycled about every square mile of Israel, and is so familiar with Israel past and present that Israeli tour guides come to him for training. He now operates the Explorations in Antiquity Center in LaGrange, Georgia, an interactive museum where people here in the U.S. can experience the life and times of Christ. Nathan Jones: How is it that you came to "accidentally" discover the Eastern Gate? Dr. Fleming: I hoped you wouldn't notice that part of "accidentally," but yes, I can't take any credit for its discovery. I would like to be able to say after years of study and research I finally found it. It was a heavy night of rain in the spring of 1969, and at the time I was a student in at Master's level in Archaeology. I thought I'd take some pictures of Jerusalem's city gates. As I was walking through the Muslim cemetery on the east side of the city I got close enough to look. I was taking a picture of the arch and I didn't realize the rain the night before had loosened the limestones at the top of a tomb there. It was a pretty heavy rain, too. But, just as I went "click," the tomb collapsed. So, the actual phrase needs to be instead of "accidental" rather "stumbled upon" discovering the Eastern Gate. Dr. Fleming: Yes, and those that know me well think I landed on my head! But, no, fortunately enough stones fell in with me that I could stack them up, climb on them, jump up, and chin myself to get out because it was nowhere visited at the time. Dr. Fleming: It was an eight foot drop. The cavity was actually a mass burial grave. There were 46 skeletons. I didn't count them right away. That was after I found out there was enough stones to get out and there wouldn't be 47 skeletons! Nathan Jones: There were bones all around you when you were down there? Dr. Fleming: Probably the cause had been some disease I would guess as there was still some cloth and some cartilage. I would guess it was about 100 years previously that this burial had been put there. There were not records for that particular grave. Dr. Fleming: Well, as my eyes got used to the dark, I could see that beyond the skeletons the back wall of the tomb was an earlier wall. The visible wall on top of the earlier wall continued eight feet below ground. Under that wall was what was amazing — completely preserved stones in nice wedge shape of the top of an earlier gate, meaning that gate was fully preserved! Dr. Reagan: Do you have an evidence of this? Did you photograph it for example? Dr. Fleming: Fortunately, not only did I get a picture or two, but they came out. Because of an uncharacteristic Middle East efficiency, when I brought my archaeology teacher back the next day after class, they had already cemented over the tomb because it is a Muslim cemetery, a sensitive place, so I was glad the picture came out. My archaeology teacher, Dr. Kohavi, didn't seem that impressed. I think he thought I had landed on my head. Back in those days we had slides and it took awhile to get the picture developed and back. When he finally saw the picture, then he realized that the arch coming up is exactly under the left hand arch today, which means that the present gate preserves what was probably two arches, because it is the first quarter of that semicircle exactly below the first quarter of the semicircle above. Dr. Reagan: It really wasn't too surprising to find the ancient gate directly below the current one because in most of the excavations in Israel don't archaeologists find that the gates were built right on top of each other? Dr. Fleming: Gates have good memories. There is a reason for putting a gate where you put a gate. It is usually a road to an important site, like the Joffa Gate or Damascus Gate. They tend to be in relatively the same part of the wall. What is remarkable is that it is exactly under it, and that this earlier gate is well preserved. Dr. Reagan: How do you end up building gates on top of a gate? Are you talking about debris piling up? Dr. Fleming: Yes, you tend to have dumps outside the city. The outside of the city walls build up. The closest we get to that in the US is a new layer of asphalt layed in front of a house. But, in ancient times cities got higher because the city was getting higher. Dr. Reagan: This was particularly true of the Temple Mount, because when the Temple was destroyed by the Romans and even when the Babylonians did, too, they pushed debris off the Temple Mount and it piled up and up and up, didn't it? Dr. Fleming: Picture the Temple on the east side of the city. When the Romans cleared it after the 70 AD destruction to build a temple to Jupiter, they couldn't dump debris north, west, or south because that was still city, but on the east was a steep slope in the Kidron Valley. And so, the eastern side of the city became a dump. Nathan Jones: Would Jesus have gone through that gate, or anybody in biblical history gone through that gate? Dr. Fleming: That is another question and we cannot be sure of. Luke's Gospel gives the most details for Palm Sunday, saying Jesus descended the Mount of Olives and entered the Temple. It doesn't say which gate. What we do have are some excavations by Charles Warren outside the Old City under the cemetery. He got permission to dig by saying he was going to dig a well somewhere else and then turned direction and dug horizontally. He actually found some of the stones from the Temple's collapsed wall. He found one stone which had a warning that a non-Jew should not proceed into the Court of Israel. And so, we should not be surprised that the debris from the Temple ended up being thrown out in the eastern side. Dr. Reagan: There is tons of debris there and you cannot excavate it because there is a Muslim cemetery? Dr. Fleming: In Israeli law, cemeteries are considered religious property, so yes, you would have to have permission. In this time of political tension, it is hard to imagine getting it. Dr. Reagan: Your falling down into that grave was a propitious moment. 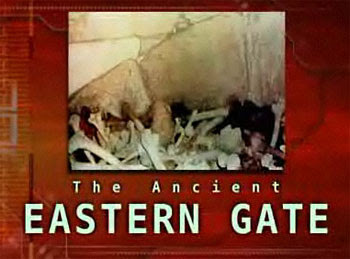 Do you believe that the gate that you discovered below the current one dates from say the time of Jesus? Dr. Fleming: It was probably there before His time. It is kind of complicated to get into it all now, but below the present gate there are ruins of two other gates. You can even see them at ground level and you can see them better from the inside. We do have Christian sources in the Fifth Century AD and one in the Fourth saying that you could still see the threshold and some of the door posts of the Eastern Gate. In the Byzantine period the Eastern Gate was a ruin, which means that the current gate is probably from just after the Byzantine period. Regarding "the Prince". If it is not the Messiah then the prince in Ezekiel 44 can NOT be a King and a Priest. Only the Messiah can be that. Also a "sin offering" is for sin that happens by ignorance and also for being unclean. If you came across a dead body, or anyone that was around a dead body, you where unclean and needed to perform a sin offering in order to draw close to God. As I recall Jesus was around many a dead people, making Him unclean and needing to perform a sin offering. MichaeMan5000 said "As I recall Jesus was around many a dead people, making Him unclean and needing to perform a sin offering." Perhaps the Jewish leaders may have thought this of Jesus but what they thought and reality were often different things. Didn't they say Jesus was doing wrong by healing on the Sabbath but He set them straight on that. Since Jesus is the Righteous Servant of YHVH, who operated by leading and power of the Holy Spirit, touching a dead person and raising them up makes them clean again, just as He also did so by touching unclean lepers and making them clean and whole again. The Holy One cannot be defiled or in any way be made unclean! Jesus, The Creator [Isaiah 9:6], the Holy One of Israel, cannot, by definition, be made 'unclean' by anything within His own creation!! DrNofog, I agree completely. Jesus could NEVER be unclean!